How Easy it is to Crack PMI-PBA with iZenBridge! HomeHow Easy it is to Crack PMI-PBA with iZenBridge! Would you like to achieve success in your PMI-PBA® certificate at the earliest possible time? Would you like to know the core habits that recent PMI-PBA® test takers developed to achieve it ASAP? If so, go ahead and read this blog to know what habits successful PMI-PBA® people installed in their exam preparation. I am giving PMI-PBA® training since beginning when PMI introduced it. Based on my experience of talking to many PMI-PBA® certified professionals, one thing I am sure that PMI-PBA® exam checks connect with your real-life Business Analysis scenarios. Thus, only study material is not enough; you need a goal based study plan to achieve your PMI-PBA® certification ambition. Also, a clear visibility of preparation is equally important and throughout your certification journey, if you connect to your fellow participants and the trainer – it is like you are going to meet your goal in half the time, because interaction always makes a difference and increase the conceptual understanding. The clarification sessions are the best thing I’m impressed about, as those sessions address key knowledge areas. Usually, I cover a topic in each session and then pick queries from the participants and discuss it Live at that point. It is the usual format of my clarification sessions, but session held on 17th December 2016 I introduced a twist. At this meeting, I invited Akanksha Ashar, who cleared her PMI-PBA® on 5th Dec 16 to share exam experience for each PMI-PBA® exam domain. I knew that participants would love to interact with someone who had just passed the exam. Last 1 week… Last 1 day… Exam day! 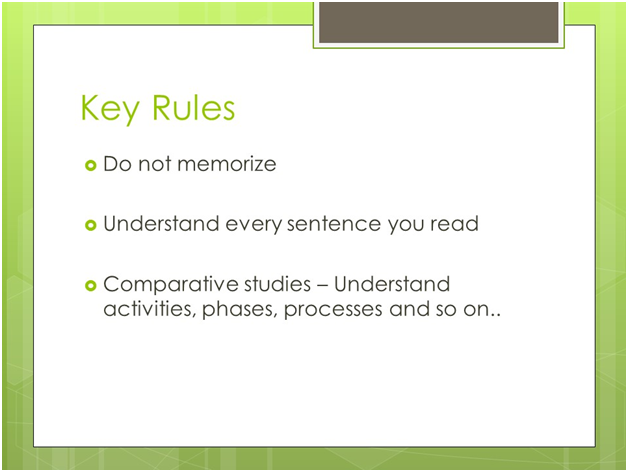 Do Not memorize: The good news in any PMI exam is that you are not required memorize exam topics. All you need to become conceptually strong in using different Business Analysis tools and techniques. It is very important to understand. Understand every sentence you read: Like you are starting the definition of something, it is important to understand every sentence word and content which you are reading. Only a few direct questions come in the exam where you can answer on the basis what you read. Around 95% questions test your conceptual understanding and your ability to understand question situation is very important. Comparative studies – Understand activities, phases, processes and so on: PMBOK® Guide Sixth Edition is a global standard in the project management. 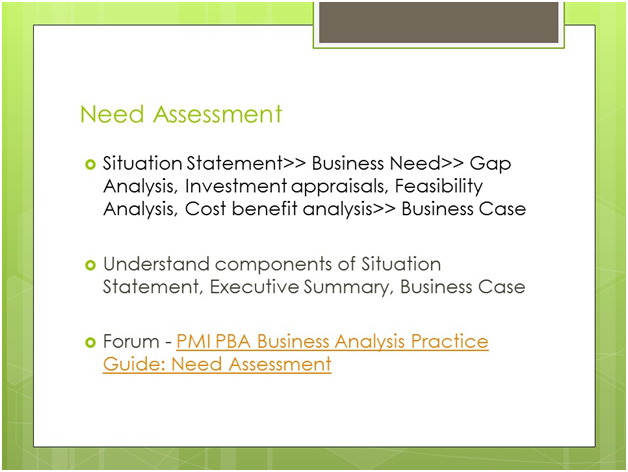 In the PMI-PBA® exam, the emphasis is on Business Analysis in a project environment. 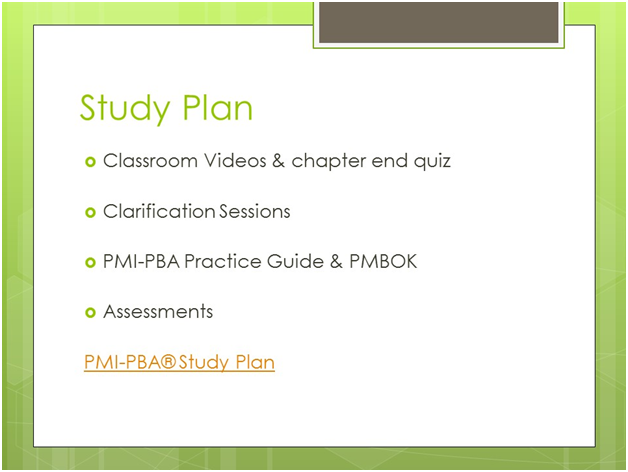 So, when you are learning Business Analysis topics, and if there is a relevant PMBOK® Guide Sixth Edition topic, referring that course video helps you connect each PMI-PBA® domain with the respective PMBOK® Guide Sixth Edition areas. It is crucial to understand and relate concepts of PMI-PBA® from the PMBOK® Guide Sixth Edition as well. Next is Study Plan: Now these are guidelines which I used, it is dependent on individuals. Here I am sharing few things which worked for me. Classroom Videos & chapter end quiz: I think class room videos are the first thing which needs to refer. As I told that at beginning step conceptual understanding is important, for that class-room style videos play a significant role. Also, after each chapter, there is a quiz, this will give an initial idea of what kind of questions might come. Quizzes are simple compared to the real exam because in starting we need, to begin with the basic understanding. Clarification Sessions: These sessions are very important. These are the Live sessions with Seema, she has immense knowledge of each of PMI-PBA® domains. And she can answer at that point of the session immediately, and she can take you to the reference which you might not connect so quickly, like which video would help you. This is very important and if you talk about or post your queries – it will help you. Because interaction makes a difference. Fortnightly you have an opportunity to interact with Seema. Which really help me also. I would recommend everyone to be very active on this. PMI-PBA Practice Guide & PMBOK® Guide Sixth Edition: Next is you need to refer these two references, – Business Analysis Practice Guide and PMBOK® Guide Sixth Edition. Now for reference Guide, I would say it is mandatory. For PMBOK® Guide Sixth Edition I would say it is recommended not necessary. Because of iZenBridge Videos, if you go through them, and you understood the basic concepts, then it is ok not to go through PMBOK® Guide Sixth Edition for all topics. Also, there is a blog written by iZenBridge to know what topics are important from PMBOK® Guide Sixth Edition. Which help you to shorten the scope for PMBOK® Guide Sixth Edition; otherwise it becomes difficult to go through each of these topics. More assessments you give, your mind would be more guided to read and understand these questions quickly and conclude them during the exam. These assessments give you rigorous practice for the real exam; otherwise, it is not possible to complete the exam in time. PMI-PBA® Study Plan: iZenBridge has also written a study plan blog it guides your exam preparation starting from knowing the basics of Business Analysis domains, mastering it and finally reaching to the practicing stage. Judging your performance in assessments helps if you are ready for the exam. If you go through this blog, it would be very helpful. 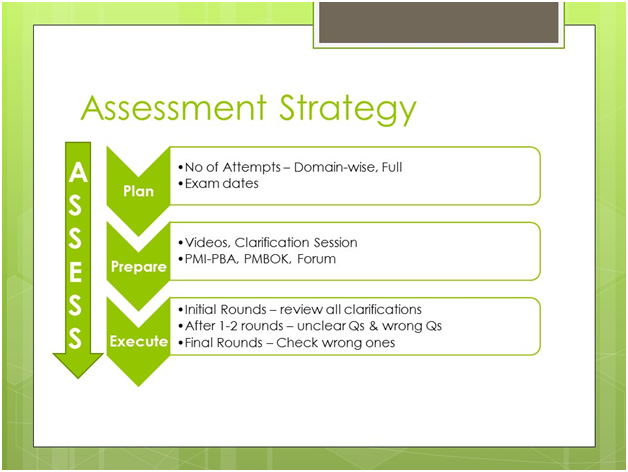 Moving on to the Assessment Strategy, the way you go or appear in these assessment exams, makes a significant difference. You should not just go and appear in these assessments exams which are there in the iZenBridge course material. Without a proper plan, it does not make sense. Plan – You should plan the number of attempts you need to take, considering your understanding of the domains, your exposure in Business Analysis activities, the experience of the current profession, and what exam date you are planning – these all things matters. You need to create a plan for the number of assessments attempts using this information – so you should be ready before those days. Prepare – Start with videos, attend clarification sessions, and read reference books. One more is iZenBridge Forum – which is available for posting questions for quick problem resolution. So, for any question any confusion you have – forum helps in creating an understanding for how to select the best answer. 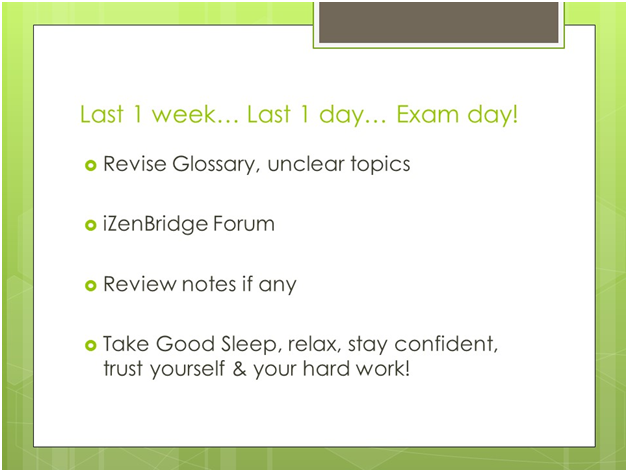 There are a lot of iZenBridge blogs also which helps quickly in exam preparation. The forum is the immediate solution for any confusion you face. Also, before any assessment you prepare, you should go through some revision at least. Sometimes we refer videos, and books long back and after some time directly jump into assessments, it does not work. Execute – Which is like giving your exam on planned date – Proper plan helps you, otherwise, it might happen that you are approaching your exam dates and you feel that you are not ready. Initial rounds – Go through all clarifications/explanations for each of the questions which have been provided. – It will build your correct understanding. After the first and second round, you should go through clarifications for which you are unclear or not confident. – also, not down those questions and go through all relevant material to get the actual context. In final round,as you are more confident – now you just needto check the wrong answers. Go through the clarifications which are provided there. Friends, assessment has all kind of questions which comes in the exam. Clarifications/explanations of questions are excellent to understand any scenario based questions. At each stage, check if you are on track? Observe dates which you have planned and cross check how close you are to your goal. You should keep on monitoring your preparation based on the plan you have prepared to achieve your goal. It will help you; there can be variations that need adjustment but – you should follow some of these things, it will help. Usually, people have questions what should I refer to last day? What should be my last one week preparations? So, it might be a scenario that you have gone through the whole material, has given a lot of assessments, – Now I recommend you to go through the Glossary – because sometimes you forget the concepts entirely, and it may confuse you in the exam. Glossary is essential; you will not get direct questions, but it is important to create an understanding and making familiar for all concepts. For unclear topics, which you could not recollect much – then you should go back to videos and reference books. These are areas which give you access to various topics to improve your understanding, for revising topics, exploring what kind of questions others people have posted. Exploring forum is the good thing to do in your last day’s preparation. It will be a very good revision for last moment. Also, during your preparation, mostly when you are watching videos, I would recommend to write certain notes. You just note down key points. Those will be helpful when you revise things. When you keep these notes, it will be helpful during last days. It may serve a good checklist for you. For the concepts, which you would like to go back. On the last day, one day before I would say – you should take good sleep, stay confident. Rest yourself. Trust in your hard work. This four hours of the exam test your endurance. You need to be very fresh, so you can consciously understand every question scenario to select the best answer. So, it is critical that you have a very good sleep. Feel fresh and have endurance build by these assessments. Scenarios might be difficult, and you might need more time to understand and answer those questions. Now let’s discuss Domain-wise Key points of PMI-PBA® exam preparation. Here I am planning to cover few topics which worked as thumb rules for me/ or things to remember! For all PMI-PBA® exam domains, includes a lot of questions, which ends with like – “what should be the next step” In these cases, more than one answer can be correct, and you need to choose the best answer based on the situation mentioned in the questions. Also, understanding the components of Situation Statement is important, because sometimes exam test which is the best Situation Statement. For a complete summarization of Need Assessment domain, a forum thread is available. it is a good reference of understanding of the Need Assessment Domain. It will give you complete mind map of all the topics of this domain. Lot of content is here, but you would be able to relate it easily. It is logically done and easy to understand. 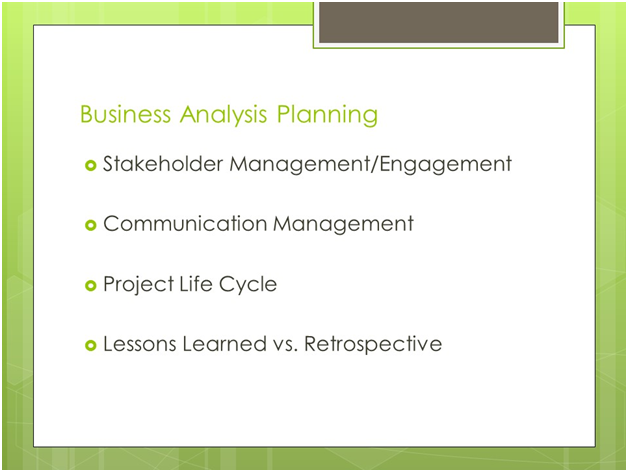 Understand components of Situation Statement, Executive summary, and finally the Business Case. In many questions, you need to understand what kind of project life cycle question is talking about. If you don’t assess the right life cycle, then you end up selecting the wrong answer. Also, remembering differences between lessons learned (Predictive/Waterfall) and Retrospective(Adaptive/Agile) need to be understood correctly. While answering, you need to assess life cycle and see whether the question is talking about the lesson learned or Retrospective. For stakeholder and communication management, I would recommend going through the PMBOK® Guide Sixth Edition; it will give a good detailed view. It would be helpful to understand in more detail. When you have more understanding, you can take right decisions. 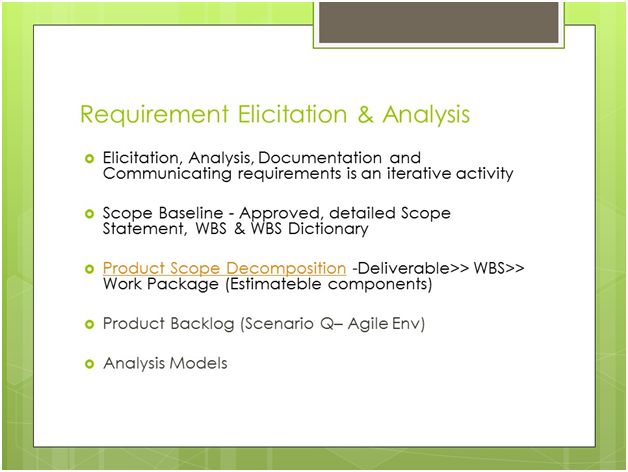 Requirement Elicitation, Analysis, Documentation and Communicating requirements are iterative activities. If you have the option to select a Business Analysis Plan, it could be wrong, because these are iterative activities and can be done when it is required. WBS>> Work Package (Estimable components). 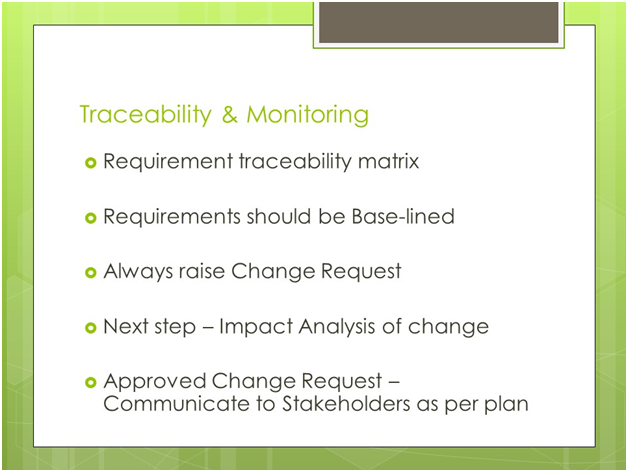 Product backlog – related questions will be coming with Scenarios based questions in Agile Environment. A good understanding of analysis Models are important. Based on situation you need to select best suitable model. Sometime a model is already selected and you need to decide if it is valid in given scenario? Evaluation: For this domain, remember Solution Verification and Validation – can be carried out in any sequence as per business need. Remember the differences, and you should have a clear understanding. Question from Evaluation domain may confuse you from the Need Assessment. We get actual results after the Need Assessment activities. So, if there is any indication of Actual Results, it is the question from Evaluation domain. Question: Are the questions that come in the actual exam on same lines that iZenBridge’s assessment questions? When you give multiple time, especially for Need Assessment, Analysis and Planning domains, you will get new questions. These are the important domains and attempting 50 question set multiple times is a good idea. When you give 2-3 times, you will get all types of questions. Also, if you are analysing explanation of both wrong and right answers, you become ready conceptually. The goal is to make you ready for the scenario based questions for each topic of the exam.Some direct questions are also available so that you know them and able to correlate other scenario based questions. Question: What reference books you used? Answer: Before joining iZenBridge course I referred 2-3 books, but later I realized the online course is enough. It covers everything. Answer: If you are scoring 85%, you are ready in respective domain. Questions:How much preparation time you have taken for the exam? Answer: Ideally, 3 months, if you study daily basis 2-3 hours, and in weekend approx. 5 hours, I took six months. Initially, I did not give time during weekdays. I was busy at work. Seema added: If you are maintaining the rhythm, two months are more than enough. In fact, if you are taking six months, chances would be that you score less because we may forget concepts with the time. We do provide a unique way of learning with Best Support System and Follow Up Sessions, worth your investment. iZenBridge online PMI-PBA® course comes with a 7-days money back guarantee if you don’t love it. This course will be one of the best course you’ve ever experienced in your certifications journey. Akanksha also shared her experience about how iZenBridge helped her in becoming PMI-PBA® certified.